See Driving Directions > Southern Sierra for context and how to get here. 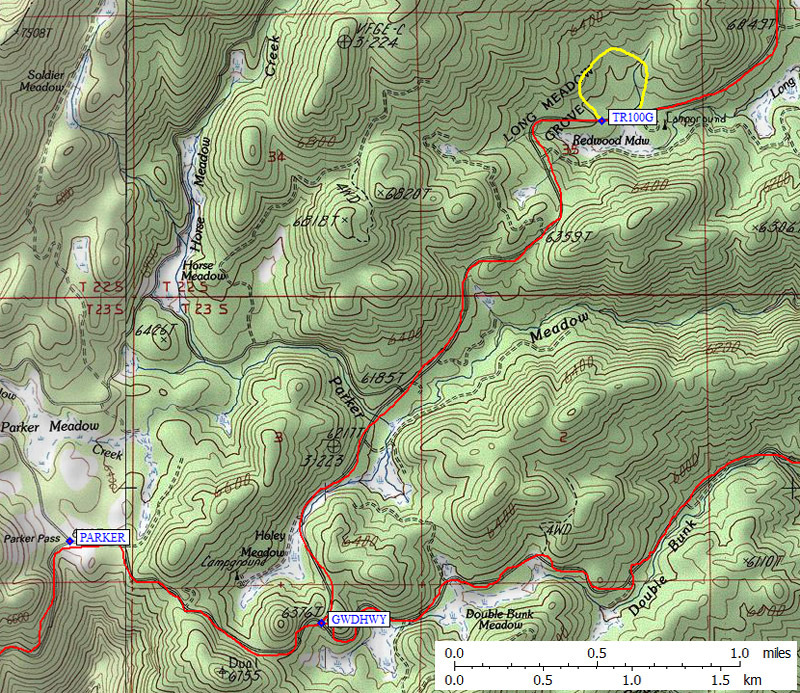 For an overview of all waypoints mentioned in the text, see the area map below. Coyote and Angora are usually climbed in the spring when there is snow runoff. This area can be very hot and dry in the summer and fall, and the roads are closed in winter. I have been to Jerkey Meadow via Lewis Camp and Lloyd Meadow, and I've also done a one-way trip that came out at Forks of the Kern. My judgement is that Lewis Camp is the most efficient trailhead to reach Coyote and Angora - there is more uphill on the way out, but it's a much shorter drive. These peaks can also be approached from Mineral King and Mountain Home. 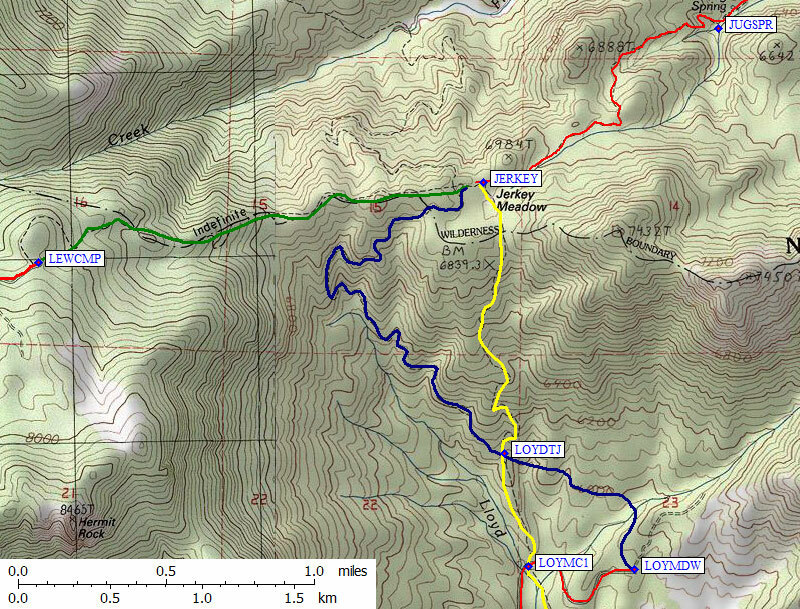 North Maggie is a shorterhike from Mountain Home, but the Summit Trailhead approach is easier terrain. Forks of the Kern is more for horsemen and kayakers, but you do get to view a nifty rock formation and some great whitewater if you go there. And of course you can visit the George Bush Tree on the way! Backpackers can cross the Little Kern from Jerkey Meadow or Forks of the Kern and walk up good trail to the hot spring between Whitney and Kaweah. The George Bush Tree trailhead is included below just for fun. It doesn't lead to any peaks or rivers, just a big Sequoia tree and a granite plaque. The Trail of 100 Giants trailhead (waypoint TR100G) is just north of Parker Pass on the Great Western Divide Highway. There is a short paved trail with standing and fallen giant sequoias, with paid parking and lots of people from the nearby campground. A miniature version of the groves in Sequoia National Park on National Forest / National Monument land! The paved road south past Thompson Spring Camp (waypoint THMPSN) has access to many unimproved National Forest camping areas, some designated right off the pavement and others on dirt roads that may or may not require 4WD. Follow the directions for Hwy 190 to Camp Nelson, then drive about 9 miles further east to Forest Road 21S50 (waypoint LEW190) and turn north on a good paved road (sometimes called North Road, but with no sign saying so). The pavement ends (waypoint PAVEND) after about 4.5 miles, where you leave the pavement and turn left at a sign pointing to Summit Trailhead. 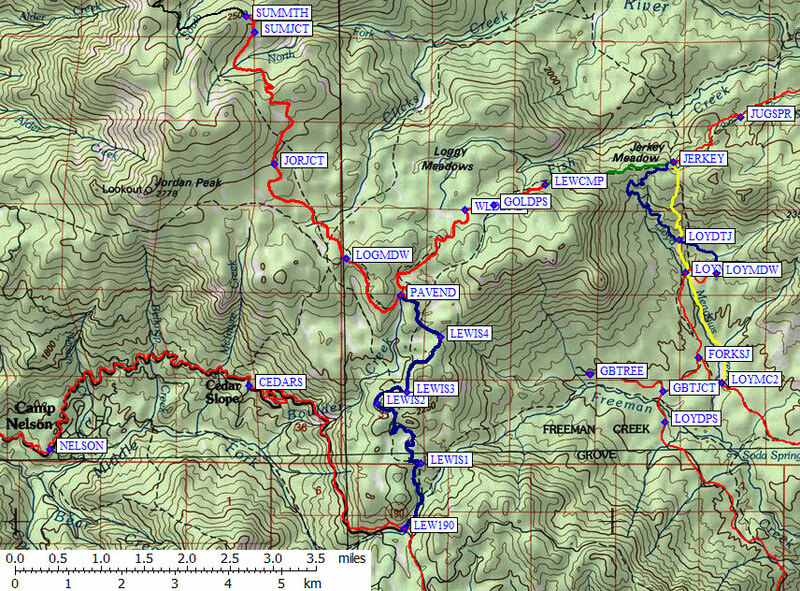 Keep right in Log Cabin Meadow (waypoint LOGMDW) and right again at the junction for Jordan Peak (waypoint JORJCT). About a quarter mile before the trailhead (just over 5 miles from the pavement) turn left at waypoint SUMJCT. If you miss this turn you'll end up going about half a mile to the wrong parking spot. Matt Hengst reports in 2013: The road was easily passable by a passenger car. Only a few rocks here and there. It would appear more of the road used to be paved but it's long since broken up. There's a pack station back there off another fork so the road sees some use. No bear boxes or facilities at the trailhead. Plenty of camping spots along the road complete with fire pits. The trailhead (waypoint PAVEND, 8200') puts you at Maggie Lakes after a 10 mile hike. North Maggie is an easier climb from this side, although dropping down and tagging Moses in the same day and looping over Sheep Pass back to camp was rather long. Follow the directions for Hwy 190 to Camp Nelson, then drive about 9 miles further east to Forest Road 21S50 (waypoint LEW190) and turn north on a good paved road. The pavement ends (waypoint PAVEND) after about 4.5 miles, where you leave the pavement and turn right at a sign pointing to Lewis Camp. Waypoint WLDBND is the wilderness boundary, where you turn right following a sign for the Golden Trout Pack Station (559-535-5304 or 559 542-2816 summer), which was under new ownership as of 2006. Bypass the pack station (waypoint GOLDPS) by keeping right and continue to the end of the road. There is a trailhead sign for Lewis Camp, but keep going to the end of the road where there are hitching posts and picnic tables. Waypoint LEWCMP looks like a new trailhead and appears to be a shortcut from the old trailhead. The map shows the trail going north from the end of this road, but going east-northeast there is another sign and another (better) trail. The trail DROPS 700 feet to Jerkey Meadow. The round trip gain is roughly the same as starting at Lloyd Meadow, but you stay higher and have some climbing to do on the way out instead of on the way in. 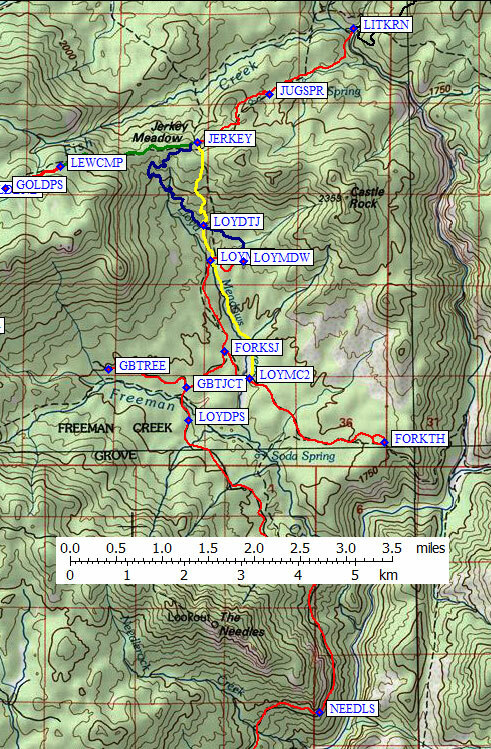 From Jerkey Meadow, you can drop NW to Fish Creek or drop NE past Jug Springs (waypoint JUGSPR) to a steel bridge across the Little Kern River (waypoint LITKRN). Go for the bridge, since the Little Kern isn't so little that you want to wade it! See area map for the southern part of this route. 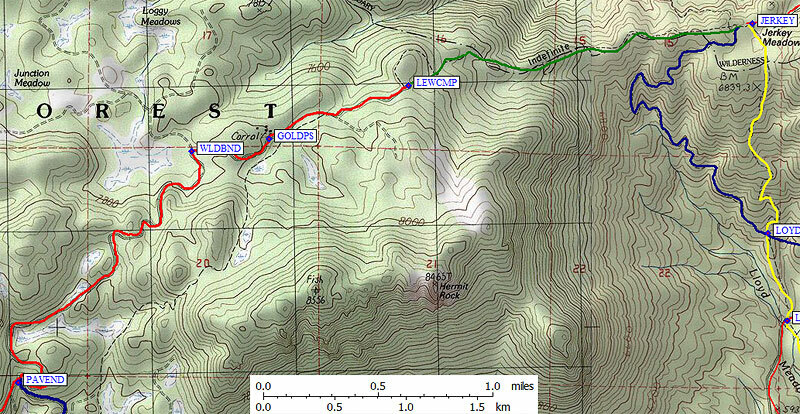 Follow the directions for Parker Pass, continuing less than a mile NW of Johnsondale to a green sign saying it's 23 miles to the Lloyd Meadow trailhead (waypoint JOHNSN). Turn north on a wide paved road which is not plowed in winter and is used mostly by hunters in the fall. 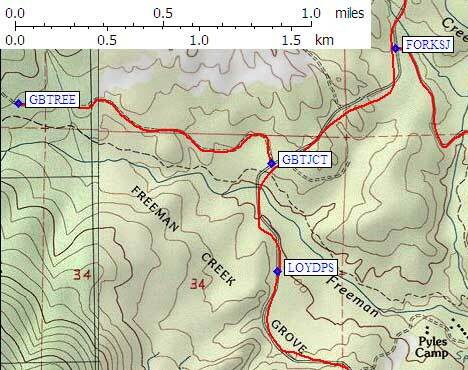 There are a number of campgrounds on the first section of this road (near Bone Creek and Camp Whitsett) and further up you'll find private land for a Boy Scout camp, the Pyles Boys Camp and the Lloyd Meadow Pack Station (waypoint LOYDPS). Ignore all the dirt side roads, stay on the pavement. At waypoint GBTJCT there is a signed junction with a dirt road that goes west (left) to the George Bush Tree (part of the Freeman Creek Grove, it seems). It's a short drive to the parking lot (waypoint GBTREE) and an even shorter walk to the tree with a plaque commemorating an act taken by the first President Bush to preserve giant sequoias. The signs aren't perfectly clear, but you head downhill from the parking lot, going south and then west if memory serves me correctly. Anyway, back out on the pavement, about a mile north of the pack station there is a signed junction (waypoint FORKSJ) where you can turn right 2.5 miles on dirt to the Forks of the Kern trailhead or continue straight 2 miles on pavement to the Lloyd Meadow trailhead (which the sign calls the Jerkey Meadow trailhead, but I call the Lloyd Meadow trailhead to avoid confusion with the Lewis Camp trailhead which also takes you to Jerkey Meadow). If you head toward Forks of the Kern, good dirt road leads you to a parking loop, a massively built corral, picnic tables, a park-like setting in tall trees, and a trailhead sign showing all the dangerous rapids downstream on the Kern. This is a pretty trailhead if you're wanting to walk to the Kern River but it doesn't get you anywhere else very efficiently. The old Fish Creek Meadow Trail follows Lloyd Meadow Creek up the drainage, connecting this trailhead road to the Lloyd Meadow trailhead road, and there are trail signs where the roads cross that trail (waypoint LOYMC1 and LOYMC2). The Lloyd Meadow trailhead (waypoint LOYMDW) is not where any map indicates it would be! the road continues uphill from where it crosses Lloyd Meadow Creek (waypoint LOYMC1) to a well developed trailhead with horse trailer parking, an outhouse, etc. There seems to be free camping at the trailhead, including water and waste hookups, but no picnic tables. It may not be free during the summer and the hookups may be only for a campground host. The trail from Lloyd Meadow CLIMBS 1100 feet to Jerkey Meadow, starting off with a traverse back to the old trail in the drainage. Look for the sign prohibiting motorized vehicles, and take care to go north instead of south. There seems to be a horse packer trail connecting this trail head to Forks of the Kern, but it's not marked! 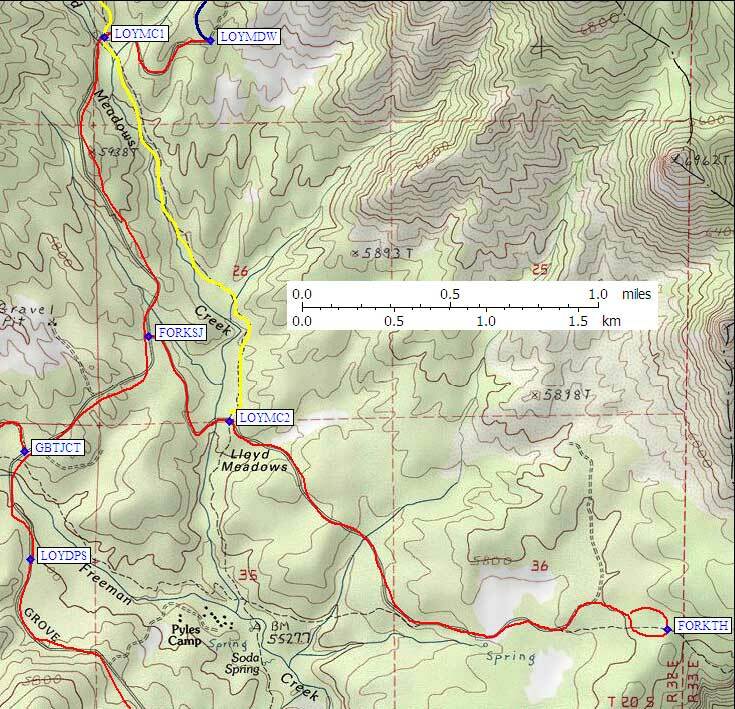 I've drawn an approximate line from the formal trailhead (waypoint LOYMDW) to the junction (waypoint LOYDTJ) of the new trail (less steep blue line) and the old trail (yellow line right up the drainage). There is a sign at LOYDTJ indicating the old trail is no longer maintained. Packers are still taking horses up and down it, so it's easy to follow (and a full mile shorter than the new trail). Take note of the wet spot you cross just before hitting the main trail, because there is no sign directing you back to Lloyd Meadow when you return on the main trail. There is a Lewis Camp trailhead sign near a large fallen log that serves as a marker for where you would turn south to cross Jerkey Meadow and return to Lloyd Meadow. There may be a Lloyd Meadow sign further west, but that would direct you to the new trail (a mile longer). 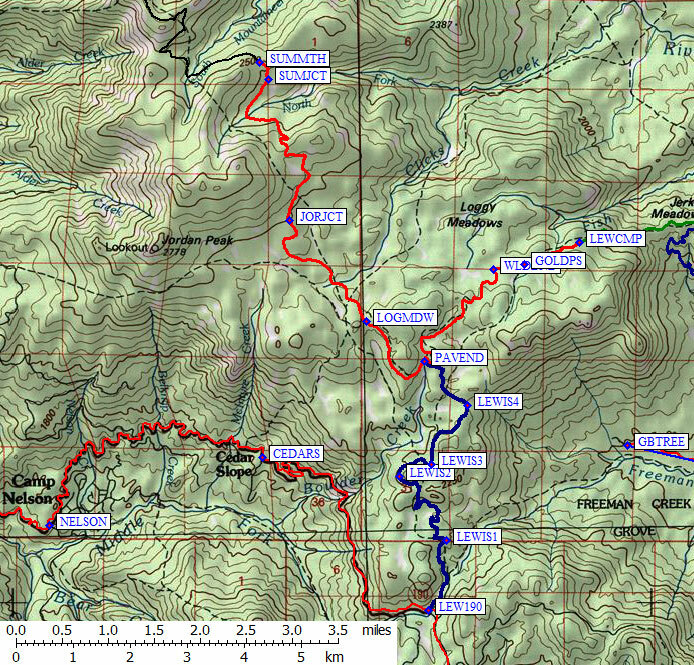 From Jerkey Meadow, you can drop NW to Fish Creek or drop NE past Jug Springs (waypoint JUGSPR) to a steel bridge across the Little Kern River (waypoint LITKRN, 4 or 5 miles and roughly 3 hours from LOYMDW depending whether you take the old or new trail). Go for the bridge, since the Little Kern isn't so little that you want to wade it! The round trip gain from Lloyd Meadow to Jerkey Meadow is roughly the same as starting at Lewis Camp, but Lloyd Meadow starts lower so it will be free of snow sooner. Lloyd Meadow also has a much wider road and more hunting/fishing/horseman traffic, all things that mean it probably gets more attention and opens sooner. This is a short loop trail, suitable for families and dogs, that winds through a grove of giant sequoias without the national park feel you get in Sequoia-Kings Canyon. Park carefully along the highway near the crosswalk at waypoint TR100G or stay in the adjacent campground to savor the crowds.